Voice Amplifier BUY Ear Amplifier, Voice Amplifier, Hearing Amplifier, Personal Sound Amplifier, Hearing Amplifier, 84189, Personal Voice Amplifier. Voice Amplifier is a Hearing Amplifier placed over the ear that amplifies and clarifies voices to allow an individual to better hear and understand the spoken word. The Voice Amplifier is a Digital Earpiece that clarifies voices. Using an advanced microchip to detect incoming sound levels, Hearing Amplifiers offer continuous volume regulation while its noise-free setting filters low-frequency background noise that interferes with hearing and understanding speech sounds. The microphone on the Voice Amplifier selects sounds within a frequency range of 1200 to 1600 Hz. 3 different sized silicone ear bud caps. Amplifies spoken words to make them more clearly audible. Ideal for television, auditoriums and meetings. Provides up to 12 hours of operation on one AA battery. Sound filter switches on and off to accommodate blocking background noises when in public or including background sounds when in nature. 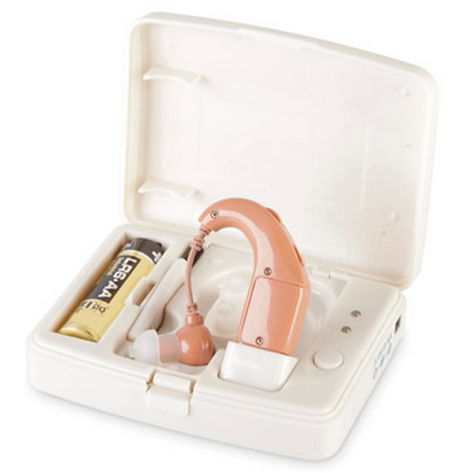 Voice Amplifier Hearing Amplifier Product Number: 84189. 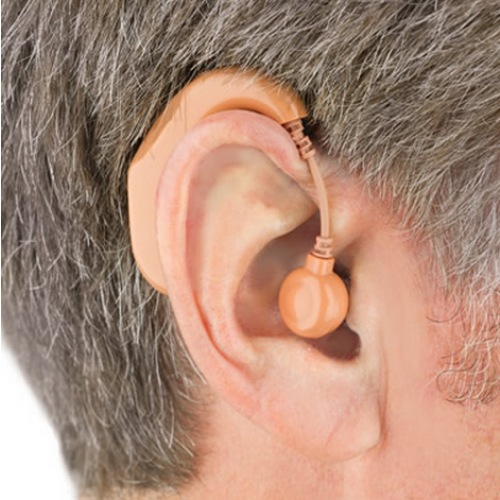 Application: Voice Amplifier Hearing Amplifier. Maximum Amplification: 25 dBA gain. Power Requirements: AA battery (battery included). Rechargeable battery last up to 12 hours. May I know where this is made from? China? USA? Germany? What is the brand name"
This is a non-branded item. The manufacturer is based in Ohio, but the parts may not be made there.